Pre-School Storytime with Miss Jenny is a weekly program full of stories, songs, crafts, fun and laughter! 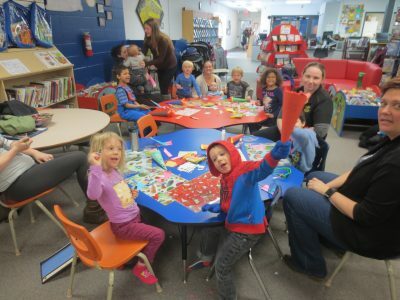 This program is packed with fun activities designed to encourage early literacy and develop social skills. When: Tuesdays from 10:30 – 11:45am and Wednesdays from 12:45 – 2:00pm from September to June with breaks for Christmas holidays and March Break. Registration: Starts in September, but parents can sign up their children throughout the year. Registration is required before first attendance. Parents must remain in the library while their children are in Storytime, but are not required to stay alongside their children. Feel free to look around, go on the computers, read or sit and socialize!